NEMA, the National Electrical Manufacturers Association, uses a rating system to define environments in which an electrical enclosure should be used. The IEC (International Electrotechnical Commission) prepares and publishes international standards for electrical, electronic and related technologies. 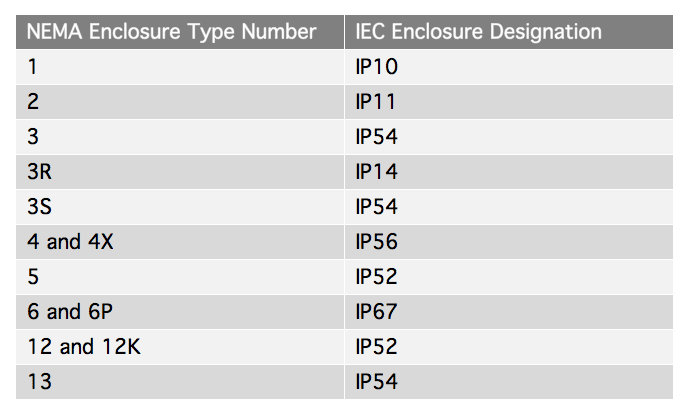 This table offers a good general conversion from NEMA enclosure type numbers to IEC enclosure designations. NEMA to IEC enclosure conversions should be verified by test; this table should be a reference and should not be used to convert from IEC classifications to NEMA Types. Selection of material is also critical. If the gasket has leaks or must be replaced, the material can lose its enclosure certification. This can lead to lost time, increased expenses, and possible damage to additional components.